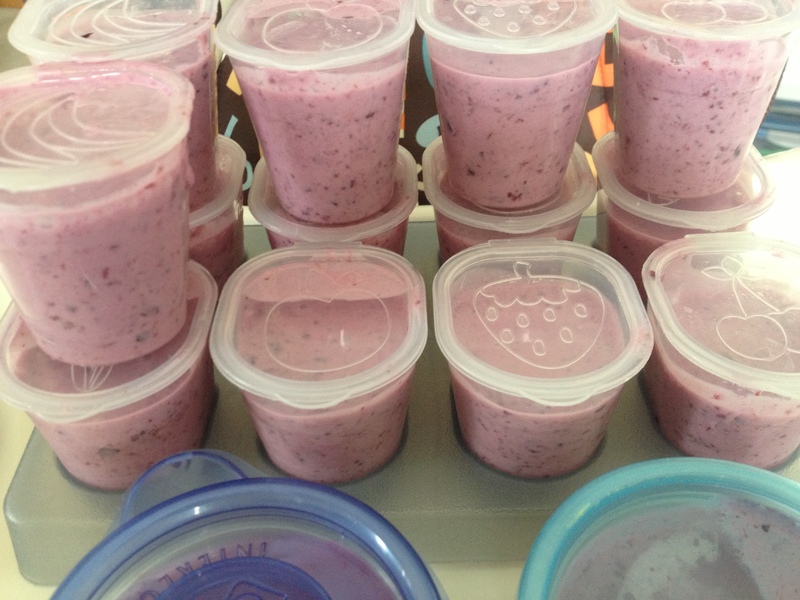 Yogurt is a staple food in most baby diets. Yet at $2+ for a four pack, the expense can add up rather quickly. Not only that, but have you ever looked at the ingredients? It doesn’t even contain real fruit. It only has “fruit flavoring”. 1. Save money – I paid roughly $4.50 and made 16 2-ounce serving portions! 3. Use any flavor combo you want – Most stores just carry banana or vanilla flavored. Make your own and use any fruit you want! I am so looking forward to making peach yogurt!! 1. Place blueberries and honey in a small saucepan. Cook over medium heat for 10-15 minutes, until juices come out of the fruit. 2. Let blueberries cool for at least 30 minutes. 3. Place blueberries in a blender or food processor. Blend until smooth. In a large bowl, mix blueberries and yogurt together. This entry was posted in Baby Food and tagged baby food, blueberry yogurt, homemade yogurt. Bookmark the permalink. Would you have to do the same process for mango as far as cooking it in a pan for a bit? Good idea. I may steam it for just a bit since I am going to be using frozen to soften it up. We’ll see how it goes! Hi! This recipe looks great! Thanks for posting. Can you tell me where you found those small baby food containers that are pictured? I got them at Babies R Us, but I’ve seen similar ones at Bye Bye Baby and other places that sell baby food making things! Hi! I want to do this but with strawberries. Any suggestions? I have not tried it with strawberries, but you could probably follow the same steps! Hmmm…it’s actually been a long time since I’ve made this. I might need to make it soon:-) I think it made it a little more runny, if I remember correctly. But my kid wasn’t picky! !